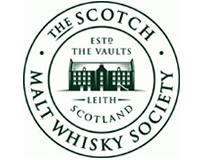 An invite was received from Helen Stewart, UK Brand Manager for the Scotch Malt Whisky Society to come along to Queen Street to participate in the matching of regional water and the Society’s Single Cask, Cask Strength malts. On arrival at Queen Street, Jim was met by Graeme Lindsay, the owner of Uisge Source, Water of Scotland and were shortly joined by Mally Graveson and Chris Miles. Graeme gave us brief history of the evolvement of Uisge Source and his vision, hopes and wishes for the future. Graeme informed us of how the regional geology of Scotland influences aspects of the water and the impact this has upon the dram. Jim’s preference for about 80% of his drams involves the addition of water, whether it be a tear drop or a splash, and only 20% of his drams are sipped neat, so the marrying of these Source bottling of water was of great interest to Jim. Uisge Source are currently bottling three waters from three different regions. Speyside – The Cairngorms Well, Moray. One of Scotland’s highest natural springs where the water is soft and low in minerals. Highland – St Colman’s Well, Ross-shire. Filtered through sandstone and limestone makes this water hard and rich in minerals. Islay – The Ardilistry Spring. This water is naturally acidic and is peat filtered and you can find the Spring if you are heading up the single track road leading to the Kildalton Cross. With all the following comparisons the Source water was up against your standard tap water. Our first marriage was the Speyside Water together with 35.106, Fantastically Floral, a beautifully soft and floral 16 year old Speyside with an Alc/Vol of 54.4%. Jim found that by adding the Speyside water it seemed to slightly enhance the flavour over tap water, making the dram softer. Our second marriage was with a Highland water together with 26.100, Galactic Root Canal Treatment, Alc/Vol of 56.5% and 9 years old. 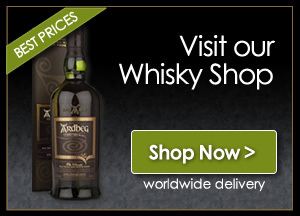 This single cask strength being young and with tasting notes of white pepper, Scotch bonnet chilli it made no difference to which water you used whether it was Source water or tap. Tonight’s final marriage was an Islay water together with 29.152, Chapter and Verse, a heavily peated 23 year old with an Alc/Vol of 49.8% On this comparison, Jim felt that tap water slightly reduced the smokiness and the Source water slightly retained a hold on the smoke. All the Society drams were taken from this April’s Outturn and Jim was also lucky enough to taste them neat and can highly recommend all three. All three participants in this tasting were impressed by the style and packaging of the Source Water but were of the view that £3.99 for a 100 ml bottle makes this a luxury brand.